We made it! I am kind of in shock how much we got done in these short six weeks. And I am so happy with how everything has turned out. It feels like our home expanded by at least double with how much we are able to use our yard now. I just can’t get over it! I’m going to go ahead and give you guys two reminders of where we came from. This first photo was taken about six months ago, before last fall’s ORC. This second photo is where we started at the beginning of April at week one. The concrete and the beginnings of the bar were definitely a step up. It continues to amaze me how much a lawn and greenery can change the feel of everything. Before we could truly get to this point, I had to get some plants into our flower boxes. I just felt that even if we didn’t get the whole fence lines landscaped, the flower boxes would really make the backyard feel complete. They tie the upper patio to the rest of the yard so well. So on Saturday morning, my mom and I went to the nursery and went crazy picking out flowers. My only requirements were 1) low plants that wouldn’t obstruct the view and 2) plants that basically can’t die. We did take a little bit of a chance with a couple, but I should be pretty safe with all of the Geraniums and African Daisies. As soon as we got back, we laid them out so that they would seem random, but that the larger plants sort of anchored the rest of them. I started planting them and laying out all of the drip lines. No way am I trying to remember to water them. That is a recipe for death for sure. The hubby luckily remembered that we got weed prevention fabric to put down, so I rolled that out as I was planting everything. The dogs were super interested in everything going on. Once everything was planted, I spread around the mulch and added the drip line pressure emitters. I tried turning the water on without them, and water shot off in every direction. Way too much pressure. Especially since the rest of the line is just capped. While I was planting all of the flowers, the hubby was working on getting out posts in for our future pergola over the bar. We have some major work to do before we can actually get that completely finish, but they really add a lot with everything we have been able to do. And….drumroll please. We added a really fun Mexican tile to the inside of the bar! My favorite little detail ever! And yes, we are fancy and have a wine fridge. Where we are currently storing a mix of beer and water. And so, now I will leave you with a ton of photos that I couldn’t choose between. Enjoy! 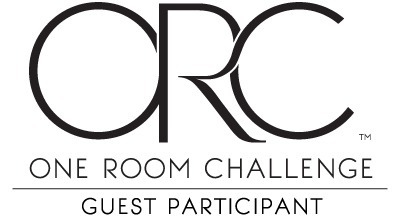 Be sure to check out what everyone else has completed during this round of the One Room Challenge! It looks AMAZING!! Way to go, I can’t believe how much you’ve transformed it. ENJOY! Andi, I am slowly (really slowly) getting around to seeing everyone’s ORC reveal. I love how you have transformed your backyard. It’s so rich with color and multi-functional. I’m sure you are enjoying the fruits of your labor this summer. Congratulations. Brilliant. We live in our outdoor space and I think it’s the greatest thing you can do for family time. It’s also the space where our friends gather with us. You will have countless hours of enjoyment out here. You did an amazing job. Thank you! I had to look at so many different backyards for inspiration on zoning. It was way harder to figure out than I thought it would be! This looks beautiful! Well done!!!! What a wonderfully fun space!!! I would love to just hang out in that backyard at the end of a long week. You put so much hard work into it and it really shows!!!! I just can’t with how awesome this space is. It looks like a photo spread. I am so excited for you guys and your fur babies, getting to gather in this amazing oasis. Well done, friend! Oh my gosh, thank you! That means so much to me! Yeah, I have a dark brown thumb…things can stay alive as long as I don’t have to intervene! Ha! What an amazing entertaining space!!! And your grass looks like a plush carpet. I want to take my shoes off and feel it between my toes. We only mow what grows — definitely NOT a barefoot lawn. Your blood sweat and tears have paid off! Thank you! It’s definitely a change from just a year ago. Last year it was impossible to get from one patch of grass (weeds) to another without stepping on dirt…. Ahh this is seriously impressive and inspiring! Way to go you guys!